Being an all year round rider, it is good to know what the air temperature is - for safety when it is cold and potentially icy and on those occasional (round here) warmer days to know how hot it really is. Cars have temperature gauges fitted as standard, but older bikes certainly do not. I had hoped to use the temperature feature on my Garmin GPS, but it relies on connecting to my mobile phone and only gives the data from the local weather page rather than actual here and now information. As you can see, it is very compact and is designed to slot into a dash panel. 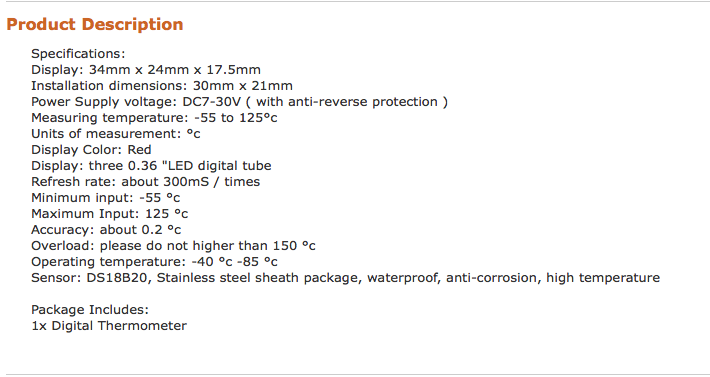 This particular one comes with a 1m long sensor cable which is more than adequate - you can get them with a 3m cable too. I opted for a red LED display as I figured it would be better for use in the dark, but you can get green, yellow or blue LED versions too. As you can see, the temperature range is more than adequate for riding (anywhere in the world) but won't be damaged by sitting in extreme conditions (like full summer sunshine). The accuracy is also adequate for the purposes of measuring air temperature - after all, this is for useful information, not for anything more scientific. This model only outputs temperature in degrees celsius (I don't know whether there is a Fahrenheit version available for the US market). 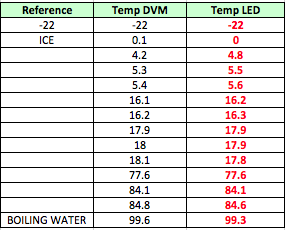 The result showed that the temperature read out was pretty close to that of the DVM across the range -22 degC to 100 deg C. I did note that it was slower to respond than the DVM thermocouple when exposed to markedly different temperatures, but for bike use where the temperature gradients are much more limited, I don't see this as a problem. For the boiling water (expected temp 100 deg C), I did not compensate for my altitude (86m above sea level) nor atmospheric pressure at the time - both of which could influence the actual boiling point of water). 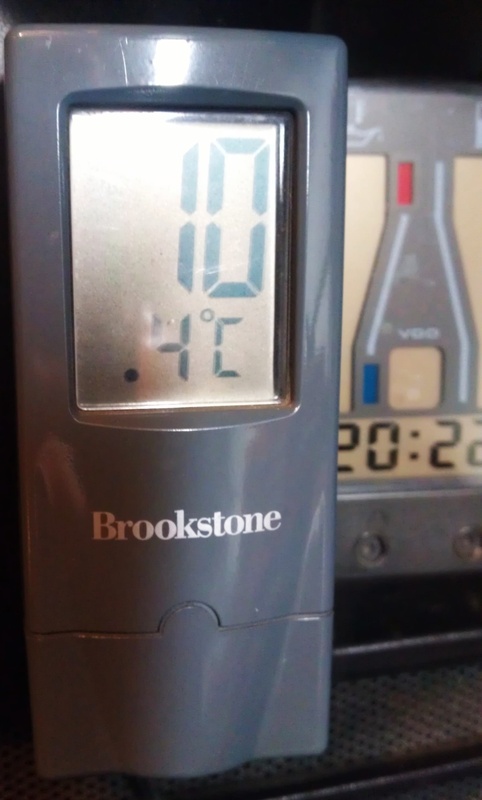 It also showed me that my deep freeze is 4 deg colder than the -18 deg C setting that I was expecting to see. Satisfied with the accuracy of the unit, I then set about mounting it on the bike. The obvious place was on the flat section in the centre of the dash panel, between the fuel gauge and the water temperature gauge. While the depth of the unit is not great, care is needed to ensure that it does not foul the internals of the map reading light below it. Cutting out the panel was a slow affair - I didn't want to use a jig saw as the vibrations could affect the other gauges (and I couldn't be bothered with taking them off during the cutting. Instead, I used the "hot knife" attachment on my gas powered soldering iron to carefully melt through the plastic and cut out the necessary slot. I tidied up the edges with a craft knife blade and used a smooth file to get the hole dimensions exactly right to receive the temperature display. Finally, having checked for a good fit, I secure the unit in place with a thin bead of adhesive. The unit needs 7 - 30 volts dc....ideal for a bike mount. I connected mine to the supply that goes to my 12V power outlet on the left hand side of my dash so that it only gets power when the ignition is switched on. As mentioned earlier, the unit comes with a 1m long sensor cable - I threaded this down into the space in front fairing (near the horn) and coiled up the excess cable to prevent it rattling around or fouling the steering. In this location, it is able to read ambient air temperature, but also remains dry so I am not inadvertently reading a wet bulb temperature (i.e. temperature with wind chill affect) on those soggy rides. When I first used the bike with the temperature gauge fitted (riding to work when it was still dark), I noticed that I was getting an annoying reflection of the LED on the bike screen - bit like a heads up display, but in mirror writing. To prevent this, I fabricated a small plastic hood that fits over the temperature gauge. 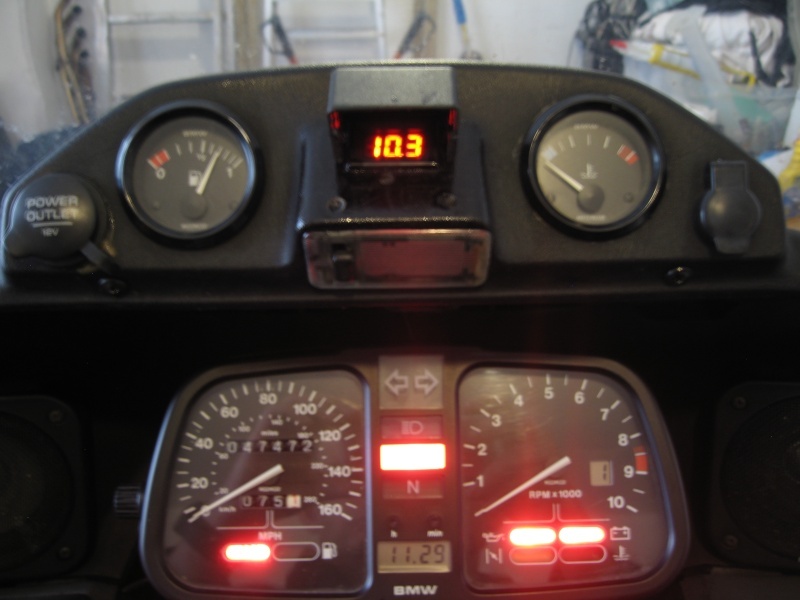 I can now see the temperature reading clearly from the riding position and the reflection on the screen has been eliminated. So, there you have it. A fairly cheap and effective ambient air temperature display that integrates nicely with the other bike instruments. As an all-year-round rider, that has me somewhat tempted. My daily commute varies from sea level to 400 feet (at Carryduff); the hill there is so exposed that before the age of decent forecasting, the gritting lorries used to pull up there and if it was frosty at the top of the hill, they'd start gritting. Even now, if it's really windy I reckon that if I can get from Carryduff to the Temple then the rest of the trip home isn't going to be a problem. Well that's an excellent one. Its also essential as I was looking at doing one too. Its always been very useful in the car, especially one night a few years back. Temperature went from -10 to -17c in about 2 minutes. We rarely get that here and it was so different. Being a tea drinker living in the country with the highest consumption of tea per head in the world [now who thought it was India or china...?] the water boiling temperature is 100c at sea level as you rightly said. We did an experiment at school graphing air pressure and water boiling temperature and it was fun. At 12,000 feet the boiling temperature is a lot less 87c and of course the tea tastes s***e. at 8,000 feet it's 91c, also s***e so no airline can ever truly serve nice tea, not even first class and china cups. Coffee doesn't depend on boiling water so its much more consistent. It is a cheap and easy fit, so I do recommend it. I was a little wary of it being a cheap product out of Hong Kong, which is why I did my little science fair project to see how it compared with my DVM. I reckon it held it's own. It also claims to be water proof - certainly, if you look at its construction, all the electrickery bits are safely sealed up in a gloop of potting compound. My daily commute to/from Bristol takes me up and over the Mendips (max height of ~890 feet). I have noticed that there can be as much as a 4 - 5 deg C temperature difference between the high point and the city. Our gritting lorries are usually pretty good and get out and do their stuff (even on the rural roads) at the first sniff of a frost, but sudden cold snaps can catch them out on occasion. My journey is most worrisome during the morning commute, when it is cold and still dark. In the feeble glow of the K100 headlight, it is hard to determine if that lighter patch of road up ahead is a dry patch, an ice patch or just an area of ground in road salt. At least having the temperature sensor, I am able to judge whether it is likely to be ice or not and ride accordingly. Of course, since fitting the device, we have had an unseasonably warm start to the winter - the lowest temperature that I have encountered since fitting it was +2.5 deg C....today it was a balmy 13 deg C! As for tea - you are spot on, but I don't think I live high enough to have any serious effect on the taste. I'm not a great coffee drinker.....I used to drink coffee with milk and sugar (coffee used to be a lot worse than it is these days and needed sugar). As a lazy student I cut out the sugar (too much effort to carry it from the shop at the bottom of the hill and the money saved was best spent on beer anyway). I then cut out milk because it was easier than fighting for space in the office fridge (and the money saved was best spent on beer anyway). Nowadays, I prefer the "black stuff" that comes in a nice pint glass and has a natural creamy top...but perhaps not while I'm at work! Ordered one... but I'm not quite sure where I'm going to mount it yet. @Born Again Eccentric wrote: So, there you have it. A fairly cheap and effective ambient air temperature display that integrates nicely with the other bike instruments.
""""" In this location, it is able to read ambient air temperature, but also remains dry so I am not inadvertently reading a wet bulb temperature (i.e. temperature with wind chill affect) on those soggy rides. Just for the benefit of the scientifically illiterate - can you explain how wind chill is measured. Human skin is not necessarily wet when subject to wind chill, yet it is affected. Since on a bike, despite the ambient temperature being X, this is not what a rider experiences, but rather X plus the wind chill factor (or should that be minus) If this is the case aren't there tables that which would show that at A kilometres per hour, then the degree of wind chill would be B. An interesting point Werewasi. There is loads of stuff on wind chill etc. online and how it is measured. As I understand it, wind chill tables gives the temperature that it "feels like" and this is invariably lower than the actual air temperature. Conversely, in hot climates, humidity and low air flow give "feel like" temperatures higher than actual. For a warm body, heat is lost to the surrounding air through a combination of conduction, convection and evaporation. Conduction is the direct transfer of heat between solid/liquid bodies (i.e. you must be in physical contact with the other body - any barrier between the bodies (e.g. gloves) will significantly reduce the rate of heat loss through conduction). Convection is a transfer of heat from a warmer body to the liquid or gas surrounding it. If the human body is at rest and there is no flow around it (e.g. wind), a thin warm layer of the liquid or gas will form against the skin and this will slow the rate of heat loss - the body will "feel" the actual ambient temperature. If the body is now exposed to a flow of liquid or gas around it, the thin warm layer will reduce in size and the rate of heat loss will increase. While the ambient temperature has not changed, the body will start to work harder to maintain its temperature and it feels as if the ambient temperature is colder than it really is. The greater the flow rate of the gas/liquid, the thinner the warm layer becomes (and the colder it feels) until a point where it becomes insignificant. At that point, any further increase in gas/liquid flow over the body has little noticeable effect on the temperature being felt. In the trusty Clymers manual, a wind chill table is provided and this states that increasing wind speed above 40mph has little additional effect on wind chill. As an added complication though, the body being a clever old device, takes measures to protect its vital organs - when exposed to cold conditions, if it can't sustain the rate of heat loss by increasing activity (e.g. by shivering), it will start to constrict blood vessels in its extremities (i.e fingers & toes). This will allow those extremities to cool more towards the ambient temperature and , as they do cool, the rate of heat loss will reduce. Good news for the core, but bad news for the extremities as they then suffer from frost bite etc. The third cooling effect is that of evaporation - if a surface is wet, a proportion of the water molecules may have sufficient energy to vaporise. The amount of energy the water molecules has is proportional to its temperature - higher temperatures will lead to higher rates of evaporation. The flow rate of the gas (air) over the liquid (water) also has a direct effect on the rate of evaporation - the higher the flow rate, the greater the rate of evaporation. Evaporation causes cooling simply due to the the fact that energy is removed from the liquid as it's vaporising molecules break away from the surface leaving the bulk fluid at a slightly lower temperature. For wet skin, the cooling effect feels greater due to a combination of conduction (transfer of body heat into the water) and evaporation (transfer of energy from the water into the air) as well as a degree of convection from the skin & water direct to the surrounding air. So a warm wet body in a breeze will feel considerably colder than the air temperature really is. Nice on a hot day, miserable on a cold one!! So, through convection, wind chill affects even dry skin (and makes it feel colder). For wet skin, the effect is worse as it feels the effect of both convection and evaporation (both of which increase as wind speed increases) and it feels much colder. Motorcycle clothing helps reduce the effect of convection (helps maintain than nice warm layer of air around our skin) by providing a layers of insulation to trap the warm air and reducing/eliminating the penetration of the wind. 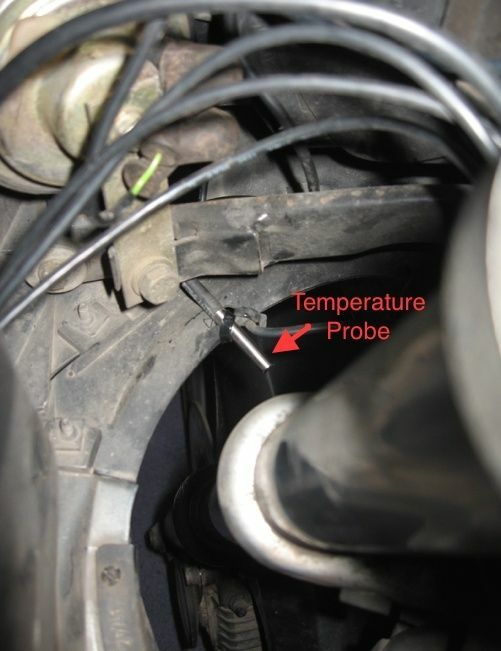 For an inanimate object (such as a temperature probe), there is no additional energy being provided, so it will assume the temperature of its surrounding air or liquid. If it is dry, it will read actual air temperature as it is at the same temperature as the air (nothing to create a thin warm layer around its surface). Hence wind chill does not affect an inanimate object if it is dry. If it is wet, then with no air flow it will read actual air temperature as the rate of evaporation is extremely low. However, if we now increase wind speed (and/or bike speed), the rate of evaporation will increase which will cause the remaining water on the probe surface to cool down and the temperature probe will read that lower temperature (will be less than actual air temperature). This also explains why roads can ice up even at air temperatures above freezing point if there is sufficient wind. For example, at an air temperature of 4 deg C (40 deg F) and with a 10 mph wind, the wind chill will give a "feels like" temperature of about -1 deg C (28 deg F). If the road surface is wet, the effect of evaporation will cool it below the air temperature and icy patches in exposed locations become increasingly likely. I guess this is why car temperature systems tend to alarm and give ice warnings as soon as the air temperature falls to 3.5 deg C.
So there you have it - not an exact science by any means...but enough to make my head hurt thinking about it!! Keeping my temperature probe dry at least removes one variable from the equation. ...and a shorter answer to you Charlie, before I relax into the nearest beer to recover from the mental strain of thinking. You make a good point - I did consider the localised effect of warmer air trapped inside the fairing"bubble" so secured the probe in the air gap between the fairing and the front fork stanchion - it is not in a direct air flow (i.e. external to the fairing) but is in an area where it I think it will get good air flow and the bubble effects should be minimal. Now just "looking forward" to seeing some negative figures on the meter, although discretion will always be the the better part of valour and I won't purposely ride if there is too much snow/ice on the road!! I mounted my Brickuino thermal probe in the tail of the bike. I figured it was protected from direct wind blast in that location yet not subject to elevated temps because of engine heat. Something I thought of myself for a while but as I had a mechanical one on the bars never got round to it. Mind you, when it hit 40C in Wicklow during the summer last year. Yeah, it was that accurate. Regarding wind chill factors, etc. What about placing the temperature sensor in something like a small length of electrical conduit with the wire end closed with plasticine? That way, its going to be out of the way of any draughts of cool (or warm) air and still be able to detect changes in the ambient temperature of the air. Just to emphasise the benefits of my little temperature add-on. A couple of days ago the unseasonably "warm" weather changed and the weather forecast said the temperature could dip down to -2 deg C overnight where I live, so frost/icy roads were highly likely. However, phone app first thing in the morning said temperature was +4 deg C. Frost on the car (the bike gets to live in the garage, not the car!) suggested it was colder than 4 deg C - my bike temp gauge displayed +0.5 deg C. Set off up the road at early o'clock (as usual) and, a couple of miles from home in one of the many dips in the road, I noticed that the temperature plunged to -2 deg C. Another few miles on and the temperature was (the promised) +4 deg C. 25 miles later the temperature had risen to a balmy +6 deg C.
An 8 deg C temperature difference over a 34 mile ride (1 hour) surprised me, but knowing the "here and now" temperature allowed me to adjust my riding style confidently so I didn't go too fast where I shouldn't and didn't go too slow where I needn't. A thing we learnt many years ago was how much the temperature can drop in a hollow, cold air is heavier and sinks in the hollows so you can also get ice there too. Couple of thoughts and questions about having a temperature gauge on the bike. First, air temperature is one thing, but road surface is another and maybe more important. I can imagine a situation where the air is +, but the road is - and has ice crystals. I would think that having the thermocouple as close as possible to the road surface is a desirable thing. Second, how fast does the thermocouple respond to changes in temperature? Even at 50kph you can be pretty far into an ice patch before the temperature reading alerted you to the fact. I lost it in my car once when I encountered an ice patch that was shielded from the morning sun by a large truck that was parked by the side of the road. Although the rest of the road had been warmed by the sun, an almost invisible icy spot in the truck's shadow was still there for a few minutes after it pulled away. A temperature gauge would have never alerted me in time. Third, regarding sensors, has anyone ever tried using one of those temperature "guns" that read surface temperature. If you want to read temperature, I would think that one of those thermometer guns aimed at the road surface would give you the most useful information. Then, rather than a digital readout of temperature requiring a certain amount of analytic thought, a red/green idiot light would be the best display. Maybe have it trigger from green to red at anything below +2. Color change in peripheral vision would alert the operator without requiring any attention to be diverted from the operation of the bike. Thermocouple response time is dependant predominantly on the sheath diameter. Bare wire thermocouples would respond in 0.5 sec - 2 sec. Sheathed thermocouples would be between 2 sec - 60 sec. If you need to know the road surface temperature to avoid icy patches, then you're probably not driving a motorcycle at the time. A temperature gauge is just unimportant information anyways. I've found taht I can't really depend on my temperature gauge because it is telling me about the environment in which IT resides, not the environment in which I reside. Mine is located in the tail and the temperature recorded there is artificially high because the sun warms the air inside the tail. The infrared guns convert an infrared light signal into an equivalent temperature reading. They are not extremely accurate unless it is professional quality and calibrated. I've got this little gem stuck to a piece of Velcro® on the dash. I swap it between my bikes. It reads about 2C above what the air temp is when not in direct sunlight. It's not backlit but the dashlights illuminate it enough and there's always streetlight residual to pass under. I have seen it read down to -17.1C and up to 42.7C in my travels round the States the past 2-1/2 years. I gave the check out girl $10 for it and her smile alone was worth that. I have never changed the battery.